It isn’t often we use our blog to talk about a service offering, however, this one has us particularly excited. As of today, we’re proud to be offering ongoing management and maintenance for WordPress installations, especially those in enterprise environments. Over the years, WordPress has taken charge as the world’s most popular content management system. The latest generation of marketers have worked with the system for the majority of their professional lives, and as their careers have advanced, they have been taking WordPress with them as they move to new opportunities and new companies. We all know that WordPress is flexible and highly extensible. It’s also easy to use, for the most part, and has there is no lack of places to learn more about WordPress if you take a quick look online. Because of all of these reasons, it’s become a system that by some estimates powers almost 40% of the top 100,0000 websites in the world. However, the platform has its flaws. For one, it’s maintenance intensive. WordPress is not a set it and forget it type of platform. You need to stay on top of the system on a regular basis. Failure to keep on top of the system can result in security breaches, infiltrations, and other issues. All of those updates take time - maintaining a WordPress site is a commitment that can’t be left aside for other priorities. All too often we see clients who launch a new website yet have no plans for maintaining other than to call us many months later to look at why something isn’t working. This scenario presents a host of problems for the client, not the least of which is the possibility of exposing the platform to attacks by nefarious characters. This brings me to my second issue with WordPress when taken off-the-shelf: security. As we all know, security is a major concern for enterprise environments. Because WordPress has such an extensive user base, it is a consistent target for attack and intrusion, with some people saying that perhaps it is the least secure content management system. Even the most astute developer and power-user will have issues keeping out every attack and malicious actor – there are just too many automated bots and worms that are evolving too quickly to count and lockout. Finally, despite being such a flexible system, marketers still need a helping hand with the day-to-day operations of the platform. I don’t think there will ever be a CMS that will allow users to completely control their web presence without having some level of technical understanding. I believe WordPress does a decent job – probably 90% or more of your website can be managed via the platform. However, when complex tasks are performed by those without technical knowledge, bloating can occur with the software. Technical debt begins to add up. Then, you’ll inevitably welcome an era of instability for your software. Because WordPress requires so much time and effort to maintain, we have decided to offer our maintenance retainers as stand-alone packages to better address the needs and requirements of corporate users. 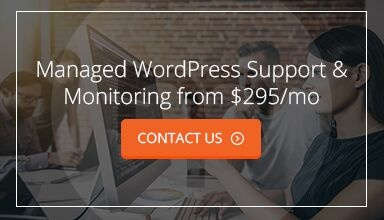 As such, today we’re announcing our Managed WordPress support packages, which focus on keeping sites updated, secured, and monitored for intrusions, downtime, and other nasty events. We find that many services offer continuous monitoring. However, not many seem actually to do anything about it. A monitor is all fine and good – you should know when something terrible is happening. However, wouldn’t it be more valuable if someone did something about it? Our service will include not just uptime monitoring, but also human intervention within 15 minutes of a downtime alert. Based on your preferences, we will respond to the issue by contacting your web host or accessing your server environment directly to rectify the issue. If the issue needs development work to remedy, we’ll reach out to you with our best estimates to correct the problem in short order. Additionally, for those who utilize AWS or RackSpace cloud services, we can also offer backup services and restoration for dedicated server instances. Security is the number one concern for WordPress users. Our service will handle this problem in two ways. First, we’ll install a software firewall in front of your website, designed to prevent the most common types of intrusion attempts. Secondly, we’ll be scanning your WordPress installation both remotely and locally, on the server, to ensure that no malicious files were injected into your filesystem. If we do find something suspicious in your scan, we’ll initiate a cleanup of your server based on your preferences. This multi-layer level of security support will mitigate your risks of running the WordPress platform and the response offered will provide coverage if the worst case happens. Our plans also include the ability to rely on our team for support and other management tasks as necessary. These hours are intended to be primarily used to support your WordPress installation, including running updates, upgrades and any other changes to the platform at your request. Each customer will be assigned an account manager, who will handle any requests you may have. We’ll run a series of updates to your software on a regular basis to ensure your site is running the most recent software possible. Moreover, if you have any other requirements such as design changes, new page designs, features or any other task, you can send them along to be addressed. Think of our team as an extension of yours, providing any support your marketing team or sales group will need to further the success of your business online. Some of our plans also include the opportunity to have a development environment hosted and maintained by us, within our server environment. This helps you a couple of ways. First, it’ll give you a sandbox where you can test new pages, features or functionality. Secondly, it serves as a reference point should any problems arise on your live site. For the duration of your services with us, we’ll maintain this environment and provide access, in addition to syncing from the live site on a regular basis. As I mentioned, each customer has an assigned account manager who is based here in the United States, working regular business hours. You can email a request to your manager or send them via a ticketing system. And yes, we have phones too. On our premium offering, we’ll conduct regular calls to support your team and their online initiatives. These calls can be to discuss upcoming plans, new feature requests, or any other topics you wish to discuss. This service is meant to be consultative and help your business achieve the most success possible from your website. Our managed services are meant to serve as an enterprise-level service offering, and as such, we’ll be providing other services that may be of interest. We’re currently developing a menu of additional offerings, but the initial list will include regular penetration testing, PCI compliance audits, ADA compliance audits and scalability options. This plan is meant to provide a level of insurance and support around any technical emergency you may experience. Our team will perform security scans and monitor your site. If a scan finds any vulnerabilities or your site goes down, we will reply, diagnose and reach out to you with next steps. Moreover, don't forget, if an issue were to arise with your site, you could reach out to us at any time as well. With our emergency response plan, any time spent remedying issues related to your site will be accrued at hourly rates. Because of the initial setup and configuration time required, this plan is only available paid on an annual basis. This plan includes all of the features of the Emergency Response package, but also provides a total of 8 hours of flex time per month to your company for use with any service that may be of assistance. Primarily, this time is meant to be utilized performing updates and upgrades to your core software, but you can easily use it for any features you may want to add, such as new pages, new plugins or other new functionality. In addition, we will provision a development environment for you which will serve as a sandbox for all future development changes, as well as serving as a testbed for any content changes you may make. This plan provides all of the features of our mid-tier package, but also adds a couple of additional elements for clients who require more regular and predictable ongoing assistance. First, the flex hour allotment increases to 20 hours. This equates to roughly an hour a day for any changes you may require. Additionally, this level provides for extra hours at a discounted rate, should you have additional tasks that need completing in any given month. Finally, this plan also introduces an ongoing consultative relationship, where our team and yours will meet on a more regular basis to discuss your goals, objectives and any future milestones you want to achieve. We’ve been working with clients as an external resource for over ten years, and we’ve seen the success that can come as a result of a marketing or sales team with a dedicated third party resource at their disposal. WordPress is a capable platform, but, with the idea of free, open-source software also comes the concept of upkeep – the onus is on you and your company to keep things running smoothly. We're targeting this new service offering at eliminating the most common pain points so you can focus on running your business while trusting that an experienced digital agency is watching your site on a regular basis. For more information, please visit our Managed WordPress microsite.